The new library in the Wakefield One city centre service hub. Wakefield one is the new home for Wakefield's flagship library and the city's museum provision. FG Library Products worked in partnership with the YPO to design and deliver this large-scale dynamic project, incorporating the main library, reference library and children's library. This high profile public library in the heart of a regeneration area needed to be bright, engaging and modern. The design team needed to create a library in the heart of the community that would promote reading, study and relaxation. Quality and style could not be compromised and specialist library designers worked closely with the client to maximise the potential of the space. 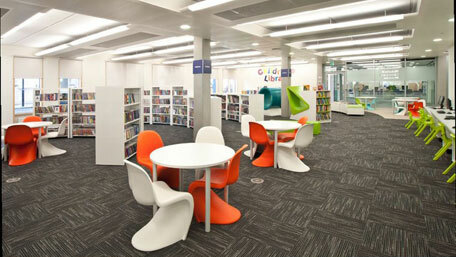 Library furniture, uniflex library shelving and freedom promotional display systems were installed alongside study furniture, easy seating and a broad range of bespoke furniture items, to create a modern and exciting public space.